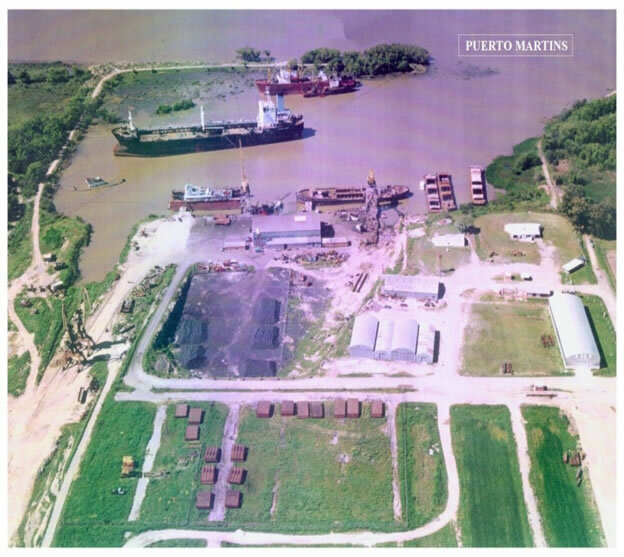 Puerto Martins is situated on the right bank of the Paraná river between Ramallo and San Nicolás and is a private wharf and ship repair facility that is also used by barges discharging manganese, iron ore and ferroalloys from Corumbá, South Brazil, for a local steel maker. Wharf belonging to TALLERES MARTINS S.A.C.I. ; vessels lie alongside 4 reinforced concrete dolphins offering a berthing front of 150 m. The wharf is fitted with 3 dockside cranes of 6/25 ton SWL and a warehouse of 6000 sqm covered area. Elsewhere within the premises there are two further cranes of 6,3 and 70 tons respectively. There is also a large open storage used for depositing manganese, iron ore or other cargoes, discharged from barges. Both the warehouse and the storage area, together with two weighbridges on the premises are under Customs control. The facility is fitted for ship repair work, with oxy/acetylene, compressed air, portable generator available on the wharf together with an adjacent workshop. Cargo handling equipment consists of 2 forklift trucks of 3/10 ton, 6 mobile 5/7 ton cranes, 2 tractors, 2 trucks, container spreaders, etc. Depth alongside 7,00 m (23 ft). Entry during daylight hours only. 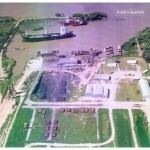 This wharf is under jurisdiction of San Nicolás Customs House and Ramallo Coastguard.